Our school in Conil is recognized in all federal states which have a law authorizing educational leave (Bildungsurlaubsgesetz). These are Baden-Württemberg, Berlin, Brandenburg, Bremen Hamburg, Hessen, ,Mecklenburg Vorpommern, Niedersachsen, Rheinland Pfalz, Sachsen Anhalt and Schleswig Holstein. Who is entitled to educational leave (Bildungsurlaub)? The details of the law on educational leave (Bildungsurlaubsgesetz) vary from one federal state to another. In general every employee who has been working full-time for a company for more than a period of six months is entitled to five days paid educational leave – in addition to normal annual leave. If not used, these five days can also be carried over to the following year, so that then ten days educational leave can be taken together. So why don’t you, too, take advantage of the law on educational leave (Bildungsurlaubsgesetz)? Our school in Conil in Andalusia offers you the chance not only of making good use of these additional days’ leave to gain new knowledge of Spain and the Spanish language, but of having a wonderful holiday, too. What formalities must be completed? Details of how and when you must apply for your educational leave vary from one federal state to the other. In many cases application must be made three months in advance. We have full details and can advise you on all points. We will also issue you – free of charge and with no obligation on your part – with confirmation of your reservation for your employer, so that you have no problems with official channels. Just get in touch with us and you will be well on the way to your educational holiday in Spain. 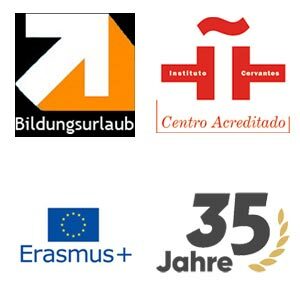 Besides the legally guaranteed entitlement to educational leave, many of the German federal states have developed programmes backed by the ESF (European Social Fund) which offer financial support to those who take part in recognized educational schemes. The Academia Atlantika is recognized as a responsible educational organization within the scope of several programmes funded by the ESF. This means that you can use your “Bildungs-Scheck” or “Quali-Scheck” to take part in one of our courses. 500 Euros and one-to-one lessons are not covered. The conditions for eligibility for this funding vary greatly from one federal state to another. In Nordrhein-Westfalen, for instance, salary should not exceed a certain level and only those who work for a company with less than 250 employees are eligible. Students at schools or in further education who are doing vocational training may also be eligible if they work more than a certain number of hours per week. Unfortunately we cannot apply for this funding on your behalf but we are very willing to help you with your application. So don’t miss this chance of obtaining financial support, but make use of your “Bildungsscheck”. Knowledge of Spanish is an ever more important qualification for working in today’s globalized world, and at the same time learning Spanish and getting to know more about Spanish culture and traditions can be an enriching experience for you personally.